Previous estimates suggested that Medicare for All would save $2 trillion. But it's even better: a new study finds that Bernie Sanders's bill would save $5.1 trillion — while providing universal, comprehensive coverage. Medicare for All advocates just received an early holiday present: a new study from the Political Economy Research Institute (PERI) at the University of Massachusetts-Amherst finds that single-payer health care will save the US $5.1 trillion over a decade while drastically cutting working-class Americans’ health spending. It’s the most robust, comprehensive study yet produced on Medicare for All, which has long been in need of easily citable research. The findings are impressively thorough. Reaching nearly two hundred pages in length, the report has been praised by health policy experts for its sound methods and clarity. Alison Galvani of the Yale School of Public Health predicts it will become recognized as the “seminal analysis” of Medicare for All. Long plagued by accusations of ambiguity and impracticality, Medicare for All now has credible economic research its advocates can cite to supplement their core arguments: that single-payer health care will be a major working-class victory, that it will save lives, and that it will represent a seismic shift toward a more just, solidaristic society. How Will Medicare for All Affect Outcomes? The research here is pretty well-established and self-explanatory. By guaranteeing high-quality health care as a human right and eliminating financial barriers to care, Medicare for All would provide preventative care and necessary treatment to huge swaths of the population who cannot currently afford it. Today, 28 million people are uninsured and an additional 85 million are underinsured, meaning out-of-pocket costs prohibit them from seeking necessary care. It’s not hard to understand why fully covering all of these people — together about one-third of the US population — will improve overall health outcomes. With universal coverage, people are more likely to receive regular primary care, helping to better manage chronic illnesses like heart disease. Doctors are also more likely to catch illnesses like cancer before they spiral out of control. Unsurprisingly, countries with single-payer systems surpass the US in nearly every health category, including life expectancy and mortality reduction, despite spending far less on health care than we do. Removing health care from the market and guaranteeing it instead as a right is the primary goal of single-payer health care. Doing so will eliminate countless early deaths and bankruptcies. But in order to make it possible, we need to answer practical questions about financing and transitioning into it. That’s where the PERI study shines. In order to tackle the question of paying for Medicare for All, we first need to know exactly how much it will cost the government. To come up with an accurate spending number, the PERI study takes two main factors into account: that demand for care will rise with universal coverage, bringing total annual health care spending up from $3.2 trillion to $3.6 trillion (likely a high estimate); and that massive savings in administrative, pharmaceutical, and provider payment spending will then bring total expenses back down from $3.6 trillion to $2.93 trillion. Using $2.93 trillion as its annual target, the study then factors in already existing public spending, which accounts for over 60 percent of total health spending. This includes spending for Medicare, Medicaid, and other public programs; health care coverage for federal employees; and the $332 billion in tax subsidies the government currently pays to private insurance companies. Altogether, public health care spending totals $1.884 trillion annually, which we can then subtract from the $2.93 trillion target. This means the government will actually need to raise just $1.05 trillion to fund Medicare for All. The most important thing to remember when discussing taxes and Medicare for All is that the new taxes are not an additional net cost or spending burden. Rather, they will amount to a mere fraction of what Americans currently spend on premiums, co-pays, and deductibles, which will all be eliminated. The PERI authors are quick to point out that there are many workable approaches to raising the needed $1.05 trillion in tax revenue, and that their proposed methods are not definitive. Their approach differs from the approach offered in Sanders’s bill, for instance. But they explain that they decided on these particular taxes in an effort to finance the program in a progressive manner, with the greatest savings going to the working class and the greatest burden falling on the wealthy. Here are the four taxes proposed in the study. As a rule, these will be set at 8 percent less than what a business currently spends on health care. Employers that don’t currently provide insurance will instead pay $500 per uncovered employee, with the smallest businesses excluded. After three years, this will transition into a flat 8.2 percent payroll tax. This will raise an estimated $623 billion each year, bringing us nearly 58 percent of the way to the $1.05 trillion goal. This is the proposed tax that will most impact working people. Set at 3.75 percent and exempting families who would currently qualify for Medicaid, it will raise an estimated $196 billion. By only applying to nonessential goods, it’s intended to spare lower-income families — who spend a greater percentage of their income on essentials like food and housing — from being too harshly impacted. It’s a debatable approach, but as we’ll see, it nonetheless leads to massive overall savings. A recurring tax of 0.36 percent on all wealth over $1 million, this will generate $193 billion annually. One of its stated goals is combating rising wealth inequality. It will in fact reduce inequality, but only slightly. For example, it will bring the average return for the wealthiest 1 percent of families down from 5.96 percent to 5.58 percent. This tax could easily be raised and the sales tax lowered. As the PERI authors repeatedly say, there are many workable approaches here. By taxing assets held for one year or longer as ordinary income (which is how short-term capital gains are already taxed) the government could raise a nice $69 billion per year. This will mostly impact the wealthy. Altogether, these proposed taxes will raise $1.08 trillion. This will completely fund Medicare for All and leave the program with an estimated $30 billion surplus. How Will This Impact Americans? 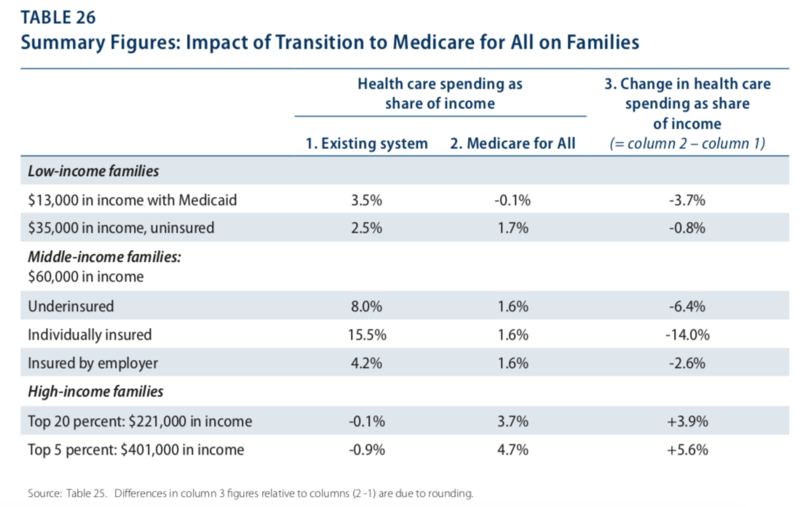 The PERI study’s analysis on the economic impact on American families makes clear that Medicare for All will be a major victory for the working class. Uninsured families are often unable to seek needed care and are forced to pay out of pocket for the care they do seek. Individually insured middle-income families, meanwhile, spend a remarkable 15.5 percent of their income on health care on average. Contrast this to the top 20 percent of Americans (those making over $221,000). These families spend an average $7,980 on health care each year. At the same time, they receive $8,290 in tax exemptions for health spending, including both the share paid by them and the share paid by their employers. This means they receive, on average, a surplus of 0.1 percent of their income through health spending. The top 5 percent of families, meanwhile, receive a 0.9 percent surplus. Medicare for All will more or less reverse this. Uninsured families who make $35,000 would pay about $600 in taxes and would no longer face any financial barriers to medical care. Middle-income families who make $60,000 currently spend up to $10,000 per year on health care, while under Medicare for All they would spend only $900 in taxes. High-income families, on the other hand, would see their subsidy disappear and instead begin paying a meager 3.9 percent of their income in taxes. Again, co-pays and deductibles would completely disappear. High-quality health care would be guaranteed to all as a right. Everyone would have total choice in their preferred provider. It’s hard to overstate how big of an impact this will have on the working class. Currently faced with prohibitive out-of-pocket costs and insufficient insurance, under Medicare for All they would pay a mere hundreds of dollars in taxes and receive comprehensive, high-quality, free-at-use medical care in return. This is not to mention the improved health outcomes they’d see. A key feature of Bernie Sanders’s Medicare for All Act is the just transition it promises to the more than 800,000 private insurance industry workers who will be displaced. While often treated as a perk intended to boost popularity, the PERI study proves that it is in fact a necessary policy component of the bill. Without offering generous benefits to workers from the abolished private insurance industry, the impressive macroeconomic benefits of the plan could be squandered due to a rapid rise in unemployment and income loss. The Sanders bill provides a broad promise to guarantee assistance to displaced workers. The PERI bill elaborates on this promise with three concrete proposals: pension fund guarantees for all impacted workers; support for near-retirement workers, including 100 percent wage replacement for multiple years; and support for displaced workers, including job training and relocation support and total wage replacement for one year. This fairly generous approach will cost $61.5 billion per year of transition. As we’ve already seen, Medicare for All can be expected to operate with a $30 billion surplus, which could be used to cover half of these needed funds. The PERI study proposes that the rest be raised through a 0.6 percent increase in the net-worth tax. Other concerns about the transition to Medicare for All typically center around the administrative challenge of bringing over 330 million Americans from a multi-payer public/private insurance system into one single, public program. The PERI authors broadly dismiss these concerns, arguing that the challenges can certainly be overcome. In fact, the study suggests that the Sanders bill’s four-year phase-in period is too lengthy and could be shortened to one or two years. As evidence, it cites the historical examples of Medicare’s establishment in 1965 and Taiwan’s quick transition to a single-payer system in 1994. The study also cites the rapid advancement in administrative technology and the relative ease with which employers could transition employees in one fell swoop, rather than year by year according to age group. All in all, the transition to Medicare for All won’t be nearly as challenging as critics suggest. It will certainly face complications, but the Medicare bureaucracy will be able to sort these out as they come. The study cautions that a four-year transition could in fact cause more problems than it solves, so a more rapid transition might be wise. It’s important that the fight for Medicare for All never become strictly about numbers. This is first and foremost a fight for working-class power and human dignity. But a path to single-payer needs practical answers, and as long as we’re facing attacks from both center and right, we need all the rhetorical ammunition we can get. After all, $5.1 trillion is nothing to sneeze at. What the PERI study provides is a handy empirical tool for Medicare for All advocates to keep in our back pockets, as well as proof of what we’ve always known — that our ideas are not only morally upright, but also practical and realistic. Medicare for All is a lofty goal, and lofty goals need workable policy. This study gives us that. While certain approaches in the study might not be perfectly ideal — particularly its financing methods — it nonetheless offers a broadly progressive approach that, as the authors admit, could easily be tweaked. 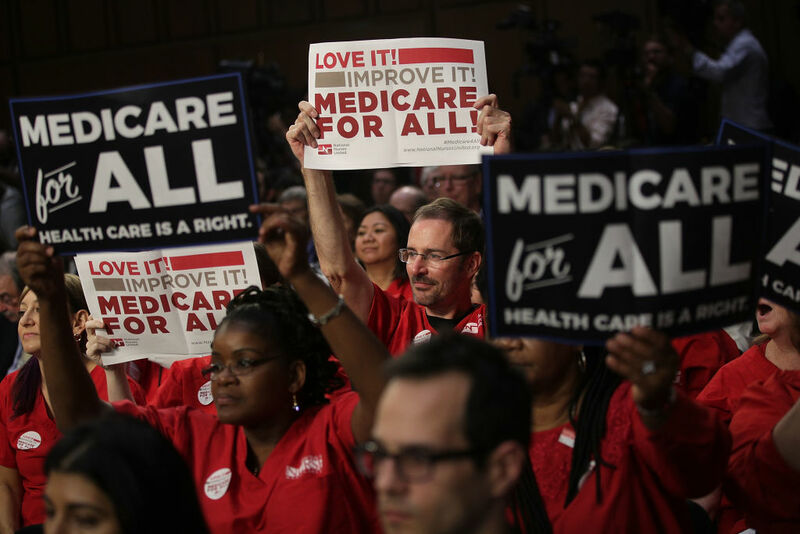 Critics have long maligned Medicare for All as unfeasible. Now proponents can put those criticisms to rest and continue building our movement for a single, public program that provides equal, comprehensive coverage to all American residents free at the point of use. As we’ve always argued, nothing less will do.